Issue Project Room and the friends and artistic collaborators of Stefanos Tsigrimanis have mounted an evening of performance art and music in celebration of the diverse artistic list of the young Brooklyn-based musician, journalist, scholar and teacher whose life was cut short two months before his 30th birthday. The evening will span genres and continents with live performances by musicians, performance artists and dancers including trumpeter/composer Peter Evans, multi-media singer-songwriter Joseph Keckler, and Greek punk rockers, Nifalia. New music ensemble thingNY will perform Rzewski and percussionist Cory Bracken will perform Xenakis. Dance/video partners Nicole and Rhys Daunic will perform a new work simultaneously in Brooklyn and Stockholm, and Gerry Visco will present photography and performance art. The event is free, however, donations will be accepted on behalf of the Stefanos Tsigrimanis Memorial Fund at New York University. Space is limited. Please RSVP at http://www.pfpinto.com/animalnudity. RAM announces a call for proposals from new music ensembles or individual artists dedicated to performing new music to participate in RAM’s new concert series. While RAM is NYC-based, our home neighborhood is located in the borough of Queens–and several of our member composers reside in Queens neighborhoods. The borough of Queens has a long reputation of being under-represented and under-served by the new music community. RAM plans to change this. In 2011, we will present live concerts of new music by some of the best ensembles and individual performers from New York by offering performance space and logistical help to ensembles and individual performers that would like to help RAM further our mission of bringing new music to new audiences. WHERE: All the concerts will take place at The Secret Theatre, 44-02 23rd Street, Long Island City, NY. The Secret Theatre is just 3 blocks from the PS1 art museum and just a 4 block walk (or less) from the N, W, R, E, V, G and 7 trains. Long Island City has a burgeoning arts scene, with the Fisher Landau Center for Art , the Dorsky Gallery, the Noguchi Museum, the SculptureCenter, the Flux Factory and a dozen other flourishing arts groups all located nearby. The Secret Theatre is home to 2 performance spaces—a large space that seats 70+ and a smaller, more intimate space, that seats 30+. The Secret Theatre will provide a box office with one attendant. They will also offer light refreshments for purchase by the audience. WHAT: RAM is accepting proposals from all groups and all genres of new music. However, at this time The Secret Theatre does not own or have a performance-quality piano. Electronic or digital instruments may be used in the space, though. The agreement between RAM, the performing ensembles, and the Secret Theatre will stipulate that The Secret Theatre will receive half of the proceeds from ticket sales while the performing ensemble receives the other half. RAM will take nothing. Secret Theatre must be guaranteed $75 for the performance, to meet their basic costs of lighting, sound, and box office staff. The use of the theater will be free. RAM will act as the curator of the series and will serve as a liason between the performers and The Secret Theatre. RAM will also offer logistical support and some web advertising via this website and social media such as facebook. Preference will be given to proposals with an entire concert program of 1 hour of music or more. Tonus Vivus Society presents Anubis Quartet – works by Crutchley, Stolte, Grella-Mozejko and Rogers. Saturday, 6 November 2010, 8:00 P.M.
Focus. 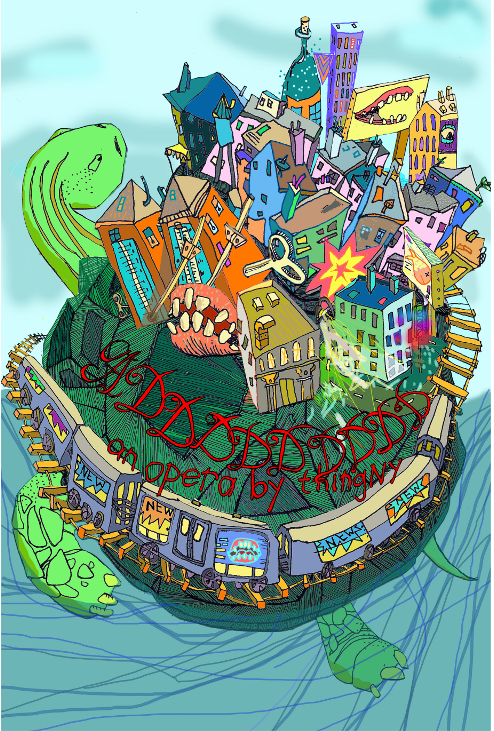 The composers of thingNY will tell you stories, sing you songs, scream in your face, try to sell you stuff and rant recklessly to themselves, filling your ears with the sweet sounds of excess. This new experimental opera by NYC’s freshest avant-garde band highlights the everyday excesses of our lives (workaholism, the thrill of consumption, the joys of gluttony, the elation of libation) and turns them into a suite of attention-deficient songs, monologues and infomercials. For four years, new music ensemble thingNY has fused fluxus-esque experimentation with theatrically-charged chamber music. For its first album, this “creative new music cabal” [Time Out New York] has chosen to release a comic book + CD package of their experimental opera, ADDDDDDDDD. With influences from Robert Ashley, Berg, Boulez, Braxton and Bjork, thingNY’s collaboratively-composed ADDDDDDDDD is an opera exploring the sweet sounds of excess. In a poetically verbose blend of noise, song, and spoken word, the five composer/performers highlight the everyday excesses of our lives as told through chants, rants, and advertising jingles. The opera opens with the both earnest and absurd prologue, “Stories by Interesting People” but quickly becomes a montage of numbers, appointments, peeves, dreams and commercial interruptions in five-part harmony. The album is now available, and its accompanying comic book libretto features artwork from various artists and musicians, including some of the band.